EVER since I was kid, I knew that I was destined to be great. Every Christmas, my mom would drag me in front of our relatives and ask me to play the piano. And since I was a great kid, with great piano-playing abilities, I would play. Beethoven was my favorite. My early years were a constant swirl of events, with everyone praising me for being a great kid. I would go home with pink cheeks, not from make up but from bring pinched so many times. And people's flattering words just seemed to hang around and never go away. With my talent at the piano, my pigtails and my rosy cheeks, I was the perfect girl. Sometimes, I felt bad for my two scrawny cousins, Mikka and Karla. They never got half the attention that I got. No wonder they were so obnoxious to me sometimes. Oh, well, I thought at the time, maybe they were jealous. One time I overheard my Aunt Bettina telling them, "Why can't you be more like Anne? Look at her. Isn't she amazing?" I just couldn't help it if I was liked by everybody. I can't remember what year it was, but there was one Christmas morning when I dug at the usual mound of presents and found more than the usual supply of chocolates. There were also the usual stack of UNO cards, and then there was a large box wrapped in green glittery paper. I ripped off the wrapper immediately, wondering what it was. When I opened the box I saw the figure of a girl with long blond hair and blue eyes. She was dressed in white, a number that looked like my mom's tennis outfit. Her shoes were of plastic rubber and by her side was a mini racket, a mini towel, another white tennis outfit in another style and a mini headband. At the bottom part of the box were the words "Sporty Barbie." I almost jumped in surprise when a hand touched my shoulder. My Aunt Gracie, who had been standing over me smiled and said, "I see you got my gift. It's the in thing back in Los Angeles. Beautiful girls play with Barbie dolls, that's why I gave you one. She's perfect, isn't she? " I nodded, and continued to stare at the doll, dumbfounded. Perfect? I thought that was me. If the doll was perfect, and I was perfect, then why wasn't she like me? Or more aptly, why wasn't I like her? I ran straight into the attic and hid the box with the doll under the old coffee table. I would go to the attic every night to look at it. I just stared at it for a long time and tried to find the reason why I wasn't like her. As I grew up, everybody seemed to change. My piano-playing sessions came in less frequent and fewer people were listening to me play. My classmates didn't want to play tag with me anymore. But, that was cool. I still got to play with the boys, although sometimes they would call me "Fatso." My cousins Mikka and Karla were now the ones who were getting the attention and getting praised – they were Barbie-like, minus the blonde hair. One day I couldn't take it anymore. I jumped out of my bed and ran straight to where I had stashed my Barbie doll. I ripped the box open and stared at it for the longest time. I never spoke a word. And then I went back to my room. It was the start of my revolution. It was the day I started going back to my world. I was perfect. And if the world thought that Barbie was the definition of perfect, so be it. I was going to show everyone that I could be like Barbie. I learned that exercise was one way to get thin, so I walked the three kilometers from home to school. I tried not to eat, but I just couldn't give up chocolates completely. I learned from our Science class that they made people fat. So I needed to take less of them. But then, I also learned that one could eat as much as she wanted and not get fat. This could be done by what they called "purging." Barfing. Different names, same task. Which is what I did. I had fun eating all the food I loved, but stricken by nerves regurgitating what I have eaten. Sometimes, the thought of not eating at all was more tempting. But then, if all the food would have to be eaten, then they'd be gone. Better eat them quickly, so they'd be gone faster. And so I ate more, and barfed more. Three months later, my waistline was still the same, and I had gained five more pounds. But just as I was getting frustrated, I realized that whoever declared that Barbie was perfect owed me an explanation. You couldn't find perfection by just looking at her waistline. There was no such thing as a perfect body. Sorry, Mattel, but if there was, Barbie just had to come in different weights and waistlines. 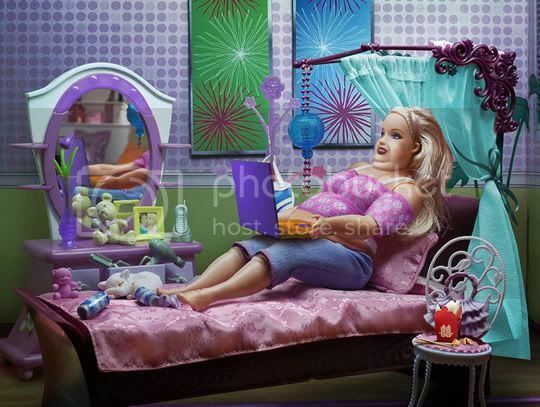 If Barbie was perfect, there would have been a lazy fat Barbie. Now I can tell myself: So what if I'm not like her? There are perks that come with being fat. Funny how I can now admit that I am one. I would never have known the difference if it weren't for Barbie. I am fat, but that doesn't mean there is a flaw in my personality. In high school, all the pretty, reed-thin girls got all the flowers. In college, a growing number of guys are dumping their skinny girlfriends to go for girls like me, who have more body mass. Hey, we're actually more huggable. And to quote Ralph Waldo Emerson, to be yourself in a world that is constantly trying to make you something else is the greatest accomplishment. Just looking at me, you'd believe that I have succeeded. T. Cabullo, 19, is a 4th year Mass Communication student at the Pamantasan ng Lungsod ng Maynila. *Disclaimer: I have nothing against Barbie and I don't discriminate against anything in this post.